Sledding down Art Hill, paddle boating at the Grand Basin, picnicking on Government Hill – just as Forest Park offers a perfect setting for activities in every season, so too can it serve as a perfect gift for any occasion. A tribute gift to Forest Park Forever is a unique and thoughtful way to celebrate weddings, anniversaries, graduations or just to let someone know you’re thinking of them. Your tax-deductible gift will help us continue our mission to restore, maintain and sustain Forest Park as one of America’s great urban public parks for the enjoyment of all – now and forever. We are happy to work with you to customize your gift to make it the perfect fit for the recipient. Simply call or email us to get started! Your tribute gift in honor or in memory of someone will go a long way in supporting Forest Park Forever’s ongoing efforts to make our park a timeless source of enjoyment for each of our 13 million annual visitors. Your generous donation will be used to maintain and enhance Forest Park. Tribute recipients or their families will receive a customized acknowledgment card, without reference to amount, to notify them of your gift. You may also include a special sentiment. All donors and recipients will be recognized in our annual report unless you wish to remain anonymous. Make Forest Park a part of your wedding day! You can ask guests to make donations to Forest Park Forever or you can make a donation in honor of your guests. We are happy to work with you to print specialized announcement cards regarding these gifts. Simply email or call us! Forest Park Forever invites you to celebrate a loved one with a symbolic “gift of flowers.” Your commemorative contribution will help bring the cheer of flowers to all the iconic areas of Forest Park and its 13 million visitors. Your gift will also go toward planting and the maintenance of flowers and flower beds and helping maintain the beautiful color in Forest Park. Forest Park is truly an urban oasis with almost 1,300 acres of diverse natural areas. The Park’s 25,000+ trees help make it a place of rest and reflection. The gift of a tree tribute will help ensure future generations can enjoy that same sense of peace in the center of a city metropolis. The Tree Master Plan dictates all plantings and calls for a diversity of tree species to be planted to provide for a balanced ecosystem. Trees are planted in the winter when they are approximately 2″ in diameter. A donation of $150 will be used to maintain all of the Park’s thousands of trees. Recipients or their families will receive a customized acknowledgment card telling them that a donation has been made in their name. 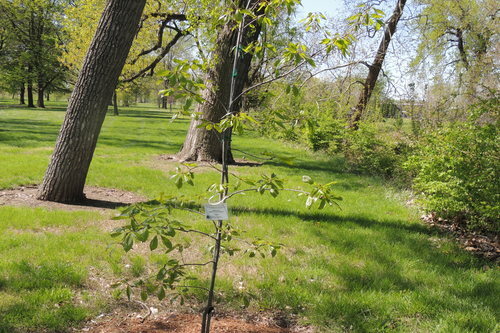 A donation of $350 will provide for the dedication of a young tree. A donation of $500 will provide for the dedication of a specially selected established tree. For the latter two options, both tribute donors and recipients will be informed as to when their tree will be dedicated. Once a tree tribute has been made, the recipients or their families will receive a customized acknowledgment card. Upon dedication of the tree, they will receive a certificate denoting the tree species and date of dedication. Both donors and recipients will receive a map of the tree’s location. A temporary tag will be placed on the tree to assist all in locating it. After six months, the tag is removed to allow the tree to grow without restrictions. For those wanting a permanent record of their tribute, a donor may receive a brick paver in the Member Paver Plaza for an additional $150 donation. The restoration of Government Hill in 2004 was a major step in Forest Park Forever’s efforts to ensure that all of the Park’s permanent structures would be preserved for the benefit and enjoyment of generations to come. You can be a part of that permanence through the purchase of a brick paver at the Member Paver Plaza, located at the base of the reflecting pool at Government Hill. For a donation of $200, you will receive a 4″ x 8″ paver that allows for an inscription of up to 3 lines, with 15 characters per line (including spacing and punctuation). For a donation of $2,000, you will receive an 8″ x 8″ paver that allows for an inscription of up to 6 lines. Brick pavers are installed twice a year, in the spring and fall, depending on when they are purchased. Click here to see a listing of all installed bricks. If you already have a brick installed, this will help you locate it. If you’re considering purchasing a brick, this can give you ideas for your brick inscription. Click here to see the location of the Brick Paver Plaza where these are installed. There’s no doubt that Forest Park is a bustling place. From the coldest January mornings to the muggiest August evenings, there is a steady stream of runners, bikers and dog walkers. However, even the most active welcome the opportunity to rest and reflect. You will find benches scattered around the Park in locations overlooking various beautiful vistas. For a donation of $10,000, the donor can work with Forest Park Forever staff to find a suitable bench to serve as a tribute. This includes an attached plaque engraved with a sentiment of 4 lines of text, with 40 characters per line (including spacing and punctuation). The benches are provided with perpetual care, including cleaning and maintenance.